What Exactly IS Einstein’s Theory of Relativity? Is time travel possible? Why can’t we travel faster than the speed of light? Do clocks really run at different speeds depending on how fast you’re moving? Does gravity really warp space and time as well as bend light? These possibilities have been used in science fiction for decades. H.G. Wells’ classic, “The Time Machine,” was published in 1895, before Einstein’s Special Theory of Relativity was even published in 1905. This goes to show that man’s imagination was exploring the possibility of such things long before it was proven scientifically. In fact, Einstein stated himself that “Imagination is more important than knowledge” and it was his own propensity for what he called “thought experiments” that brought him to the concept of relativity in the first place. Supposedly, he was staring at a gas light one foggy night wondering what it would be like to travel on a light beam and shortly after that the Special Theory of Relativity (STR) was born. The main point of the STR is that the only thing that’s constant is the speed of light; time is not, space is not. The speed of light, 186,000 miles per hour, is often referred to simply as c. In fact, the term “miles per hour” which you hear every day contains the basis of a physics equation related to time and distance. In other words, if you only know simple algebra you can understand how the distance you travel (length or L) depends on how fast you’re going (velocity or v) and for how much time (t), or L = vt. Simple. But there’s a catch. That only applies to what is known as an inertial reference frame, or one that is not moving. Now I’m sure you know that the Earth is moving, through space as well as around the Sun, but as far as you’re concerned when you’re riding in a car the Earth is standing still. However, when you get into what are known as relativistic speeds or those closer to the speed of light, that equation changes. As far as a time machine is concerned, going forward in time seems more feasible than going back but that’s not to say it’s impossible. However, the STR really doesn’t postulate going back in time, only that clocks run at different rates. This has been proven at the atomic level by observing atoms that have a known rate of decay (or lifetime) traveling at relativistic speeds where they last longer as measured by Earth clocks. So why can’t we travel faster than the speed of light? This comes back to the speed of light being a constant. Energy of movement, or what is required to move something, is defined by the mass of the object times its velocity squared, or E = mv2. Starting to sound familiar, like the infamous E=mc2? Here we go again, velocity can’t change so the others must and what this boils down to is that the energy required far exceeds what can be achieved as the mass increases, which also occurs at the speed of light. So, according to Einstein, the reason we can’t travel at the speed of light is because at those speeds the mass of the vehicle will exceed its ability to carry the fuel necessary. Of course if you’re a UFO fan like myself, you may wonder how they could possibly get here and move erratically like they do. 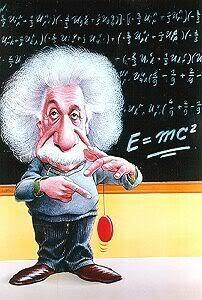 And that brings us to Einstein’s Theory of General Relativity which relates to gravity. Gravity is a force that creates acceleration, or a change in velocity. Drop something and it accelerates to the floor or ground. According to Einstein, the gravity of large objects like the Earth or Sun will also warp space and time. When you see those pictures depicting a blackhole they usually show a funnel-shaped grid, indicating how the force field around it warps space. Gravity can even change the path of light, which was proven by Sir Arthur Eddington during a solar eclipse on May 29, 1919. When you look up at the sky the stars are in predictable locations, which is why they have been used for navigation, even by the “star tracker” on the Space Shuttle until the advent of the Global Positioning System, a.k.a. GPS. However, during a solar eclipse, there is a massive gravitational object available in the sky (the Sun) that when darkened by the passage of the Moon, allows the stars to be visible during the day. Knowing where the stars should be versus where they appeared showed a difference that proved Einstein’s Theory of General Relativity. This has been proven repeatedly since then by observing distant stars, an effect known as gravitational lensing, which will sometimes even cause an object to appear to exist in two places. As far as UFOs are concerned, it appears that they utilize extremely high magnetic fields combined with certain radioactive elements to create a gravity field around the craft itself. This, in turn, provides the vehicle with its own gravitational field, essentially creating its own reference frame so that it no longer is subjected to Earth’s gravity and can thus move in ways that defy what our known technologies can currently achieve as far as hovering and drastic changes in direction. Einstein wanted to discover a Grand Unified Theory that explained how all the forces in the Universe related to one another. He was never able to do that and scientists today continue his quest. The evidence today, however, suggests that they are getting close! Various new theories continue to evolve such as String Theory, which relates to subatomic particles (or those smaller than an atom) and M-Theory which suggests there are multiple universes. Quantum Theory is another fascinating subject that’s been around for a while with significant potential for science fiction such as telepathy. More on that next time. Marcha Fox is the author of the Star Trails Tetralogy which includes the novels “Beyond the Hidden Sky,” “A Dark of Endless Days,” and “A Psilent Place Below.” The final volume, “Refractions of Frozen Time” was released in March 2015. With a physics degree from Utah State University and over 20 years working at NASA’s Johnson Space Center in Houston, she is never at a loss for something new to incorporate into her stories. Her Facebook Page is https://www.facebook.com/marchafoxauthor and her book website is http://www.startrailssaga.com. Follow her on Twitter @startrailsIV. This entry was posted in Physics Explained and tagged Albert Einstein, bending light, Einstein, Einstein's Theory of Relativity, general relativity, gravity waves, H.G. Wells, physics, relativity, space warps, special relativity, The Time Machine, thought experiments, time travel, time warps, traveling faster than the speed of light by Marcha's Two-Cents Worth. Bookmark the permalink.